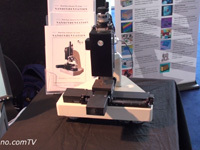 Mickael Febvre shows us the Veeco Dimension Icon high performance atomic force microscope (AFM). 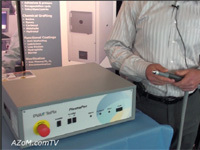 With large sample stage it can perform measurements in a variety of atmospheres. Dr. Stuart Parkin from the IBM Almaden Research Center tells us about a new type of memory that is theoretically about a million times faster than current hard disk technologies, with very fast access times, but at the same time very cheap to produce, along with many of the benefits of solid state memory. 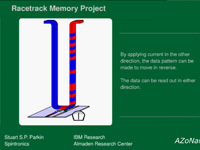 Called racetrack memory, it uses nanowires and spintronics. Demetrius Chrysostomou shows us the PVA TePla Plasma Pen which is used for precision cleaning of surfaces and raising the surface energy of surfaces prior to operations such as welding or bonding. It is commonly used in the automotive, electronics and flat panel industries. Nikolay Novozhilov from NT-MDT takes us for a tour of their SOLVER NEXT AFM/SPM. 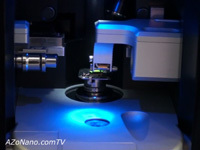 he shows us how easy it is to change from AFM to SPM, as well as demonstrating the software control system and how easy it is to scan a sample.